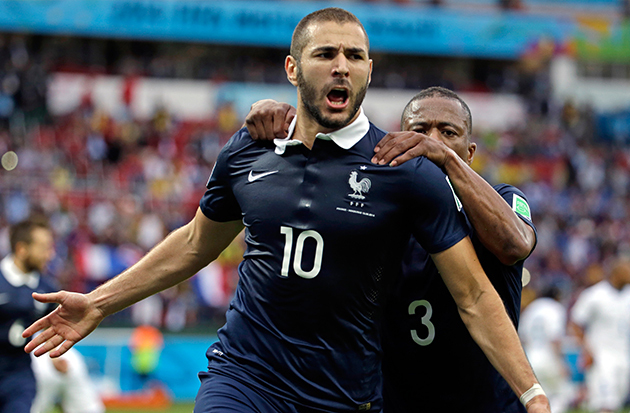 PORTO ALEGRE: Karim Benzema scored twice as France beat 10-man Honduras 3-0 in a bruising World Cup clash on Sunday where goal-line technology awarded the first international goal in history. Three minutes into the second period, the GoalControl computer referee was called into action when a Benzema volley hurtled off off a post. The ball flew across the face of the goal before hitting Honduras goalkeeper Noel Valladares and then rebounding into the goal. Valladares tried to scoop the ball to safety, but Brazilian referee Sandro Ricci awarded the goal -- classed as an own-goal -- after consulting the instant technology. 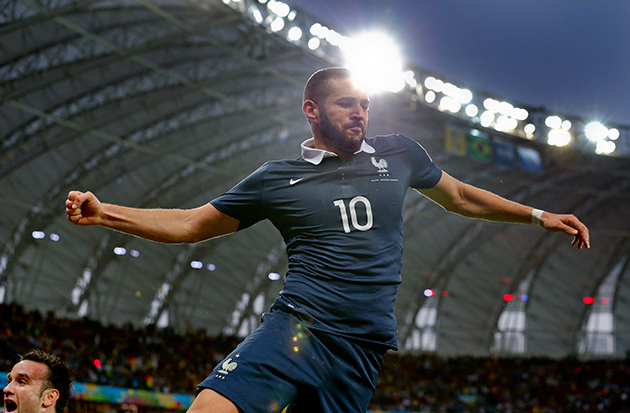 "I shot and the ball hit the post and then the goalkeeper," said Benzema. "I saw that the ball crossed the line. I don't know if having technology like this is good for football but the most important thing was that we have won." France boss Didier Deschamps was supportive of the new technology, but also concerned at the confusion caused as replays inside the stadium first showed Benzema's initial shot had not gone in before confirming the ball had crossed the line after hitting Valladares' hand. "I think it is a good solution and the goal then counts. The referee gets the signal we were just worried that on the screen they showed an image that didn't correspond to the goal. "It was only after the goalkeeper pushes the ball into the goal it is a goal. "The image shown must be the one that justifies the decision of the referee." Benzema opened the scoring from the penalty spot after Wilson Palacios was sent off for two bookable offences on Paul Pogba. And the Real Madrid striker rounded off a fine afternoon with an emphatic finish 18 minutes from time. 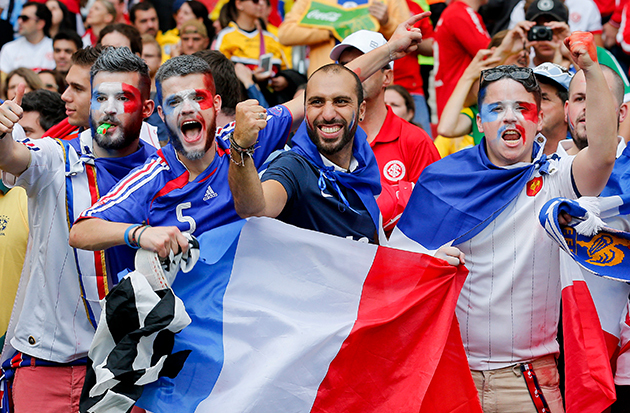 Victory moves France above Switzerland on goal difference in Group E after the Swiss beat Ecuador 2-1 earlier. The two European sides are set to meet next on Friday in Salvador. France's game began in bizarre circumstances as neither sides' national anthem was played before kick-off. Normality was restored once proceedings got underway as France dominated from the off. Blaise Matuidi had the first clear chance on 15 minutes when Mathieu Valbuena's free-kick was only partially cleared and the Paris Saint-Germain midfielder's effort was brilliantly turned onto the bar by Valladares. Antoine Griezmann was then also denied by the crossbar for Les Bleus as he rose highest to meet Patrice Evra's cross but his header clipped the woodwork on its way over. Benzema saw another good opportunity fly over moments later as he headed off target after a fine counter-attack involving Matuidi, Griezmann and Valbuena. Ricci had a big call to make midway through the half when Pogba clashed with Palacios. The Juventus midfielder lashed out at Palacios after appearing to be stamped on, but Ricci showed only yellow cards to both. Palacios was only to last another 16 minutes in any case as he stupidly bundled Pogba over inside the area a minute before half-time and was shown his second yellow card. Benzema stepped up to convert the resulting spot-kick to register his seventh goal in as many games for France and his first in a World Cup. The 26-year-old was heavily involved again as France doubled their advantage within three minutes of the second-half courtesy of the goal line technology. Benzema should have added to his tally moments later when he was picked out by a fine low cross from Griezmann but could only fire straight at Valladares. However, he wasn't to be denied 18 minutes from time when he fired expertly high past Valladares from a narrow angle to seal the three points. Let's Talk: Are Schools Killing Our Love of Maths?